An art project that spread AIDS consciousness like a virus, examined by an artist-activist. In the mid-1980s, the Canadian art group General Idea (AA Bronson, Felix Partz, and Jorge Zontal) created a symbol using the acronym AIDS, arranging the letters in a manner that resembled Robert Indiana's famous LOVE logo. This launched Imagevirus, a project of paintings, sculptures, videos, posters, and exhibitions that investigated the term AIDS as both word and image, using the mechanism of viral transmission. The Imagevirus spread like a virus, producing an image epidemic in urban spaces from Manhattan to Sydney. It was displayed as, among other things, a Spectacolor sign in Times Square, a sculpture on a street in Hamburg, and a poster in the New York subway system. In this detailed study of the Imagevirus project, artist and writer Gregg Bordowitz analyzes the work from the perspective of his own involvement with activist art initiatives in New York during the 1980s and 1990s. 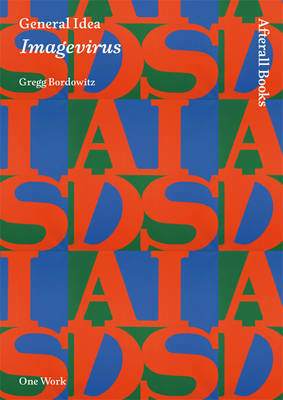 Bordowitz explores the virus as idea, as tactic, and as identity. General Idea felt compelled to make Imagevirus at a time when AIDS was emerging as a global epidemic affecting gay men disproportionately; when homophobia seemed to drive U.S. AIDS policy; and when the exigencies of AIDS activism created a demand for agit-prop and direct action. General Idea adapted their methods to the new situation, using the threat of viral infection and a poetic understanding of language as their model for artistic production and ideological struggle.